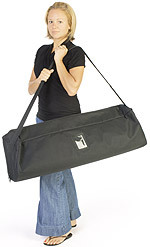 Carrying bag easily holds display for easy transport. Hook-and-Loop fabric banner for hanging accessories & posters. 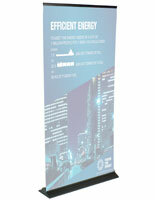 Retractable banner stands set up in minutes with no tools required. These hook & loop banner stands make setting up a display section in a retail store or a trade show booth quick and easy. 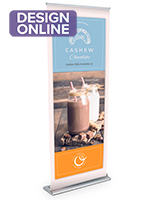 Retractable banner stands come with a carrying bag for transporting the display that also keeps the display dust free when not in use. 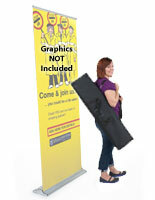 This carrying bag has a shoulder strap to make moving this banner stand really easy. 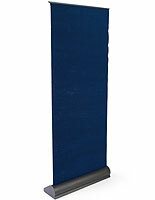 Banner displays, portable banner stands, and other retractable banner stands use a folding pole to hold up the hook & loop banner. 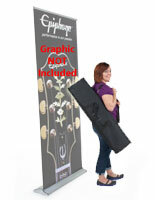 This pole can be stored in the carrying bag along with the rest of the retractable banner display when not in use. 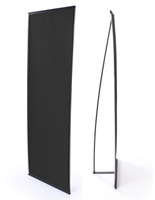 Hook & loop banner stands are made from durable black aluminum for use in heavily trafficked areas. Retractable banner stands feature a 34-3/4" x 80-1/4" black hook & loop fabric banner that can hold various accessories that weigh 5-7 lbs. These accessories can be used to display brochures and graphics, making them ideal add-ons when purchasing retractable banner stands. Be sure to take off all accessories when slowly retracting the banner back into the base in order to prevent damage. 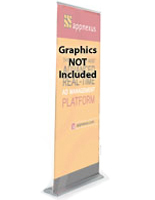 Order retractable banner stands to use at your next trade show today! 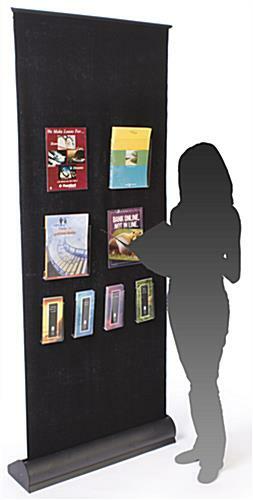 35.4" x 86.4" x 9.5"
37.0" x 10.0" x 6.5"
Sturdy stand can host any needed banner for specific trade shows. Especially economic if you exhibit for more than one product, solution, division or company. Thanks for taking the time to write this excellent review, Steve! 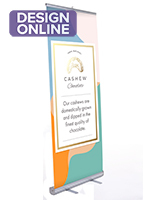 We're thrilled that this banner stand became the perfect trade show solution for you. It's especially portable and versatile so you can exhibit at multiple shows and easily change out the graphics to suit your needs. We hope you continue to use Displays2go for trade show and business display solutions! Loved it so much, we ordered 5 more. Fast shipping. Good product. Can't wait to use. Thanks for the review, Rebecka. When you do try it out, feel free to share a photo of it in use on our Facebook wall! We love it when our customers show off their products "in action!"